Some stories require multiple tellings. Following up on what remains one of this blog's more popular posts, I couldn't help snapping this picture the other day. I call it A Public Confession. A Public Confession - Click to enlarge. More teens have smartphones today than ever before. To me, this means that more teachers have powerful technology to use as a resource for furthering their instructional purposes. It also means that more teens need more help in learning how to best use that power in safe and productive ways. 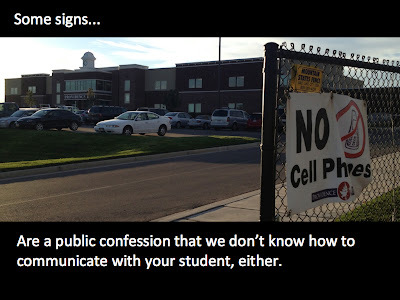 If we don't teach students balance and appropriate cell phone use, who will? In other related news, Dan Haesler provides a nice angle on the state of social media instruction. Imagine for a second if we taught our teenagers to drive a car in the same manner we attempt to teach them about social media. 1. Driving lessons would be taught by adults (teachers or parents) with little or no experience of driving. 2. Driving lessons would only focus on what not to do. 3. Driving lessons would NEVER take place in an actual car. Outstanding analogy for an important problem. 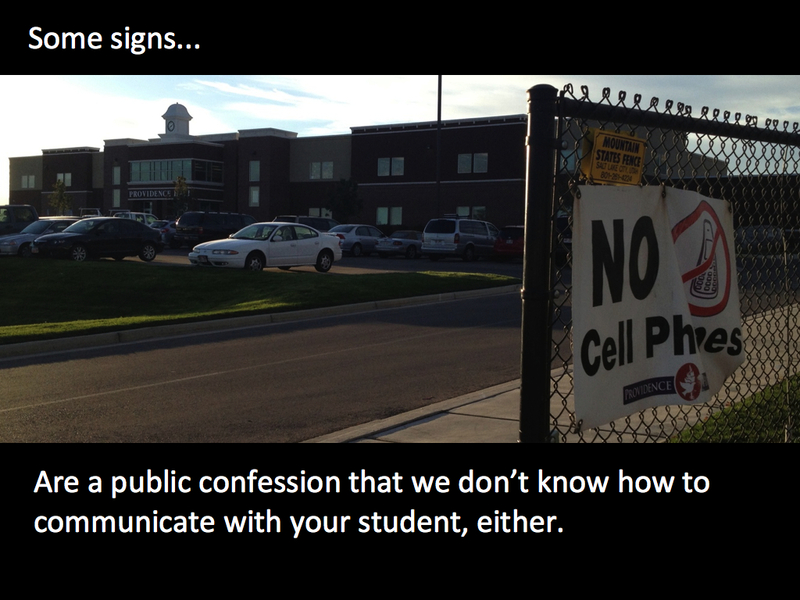 Policy would allow for teacher autonomy in using cell phones and social media as instructional tools. More teachers had the technological-pedagogical skills and philosophy required to effectively harness these technologies for in-class use. More curricula encouraged real-world experience instead of the artificial environments that adults seem to think serve children best. Yes, some stories require multiple tellings.